For every injury to a New York pedestrian or cyclist that briefly makes news, there are hundreds that get no attention whatsoever. Even when there are witnesses to such a crash, once the wounded are transported and police clear the scene, it becomes nearly impossible to glean information that might prevent another collision or help the next victim. 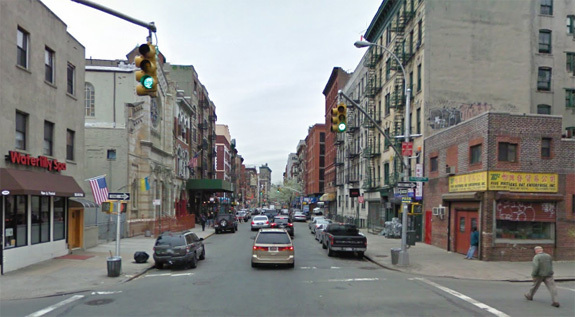 On Thursday, March 22, at 8:30 p.m., two Streetsblog readers were on Broome Street just west of Elizabeth Street, in Manhattan, when a cab driver “suddenly accelerated in reverse” and hit a cyclist who was riding with the flow of traffic. They wrote to tell us what happened. He was thrown through the back window of the taxi and his face was crushed. The bicycle was mangled and broken in half. I noticed after the ambulance took the cyclist away that he had an insulated square bag attached to his bike; he was on the job delivering food. “Unfortunately the police have no intention of charging the driver for anything, even though several people saw him accelerating in reverse and crash into a cyclist riding correctly,” they report. Streetsblog has queried NYPD for details, including the identity of the victim and whether the driver was charged. But unless a victim dies, it is virtually impossible to get a name. And unless a victim dies or is believed likely to die, the police investigation is limited to filling in the boxes. Because NYPD protocol mandates that an officer witness a violation in order to issue a summons under state vulnerable user laws, drivers who maim and kill are routinely exonerated of wrongdoing on the spot. Of course it’s possible that a civil suit will arise from this incident. But as far as the public is concerned, in all likelihood this crash will be represented as one number among thousands in a data set. Other than that, it will be as if nothing happened. No info on this crash. Sorry. In the span of 1 minute last night, I watched 2 cars back-up at 15-20mph the length of a Manhattan street block to reach an open parking space. Given the poor sight-lines when operating in reverse, this should be considered reckless driving by definition. And maybe count this as another reason for Donald Shoup-style parking reform; more routinely open parking spaces could lead to less of driving in reverse. The law has to change NOW. Is it cool if I shoot someone so long as an officer doesn’t see it happen with his or her own eyes? My wife witnessed a bike crash a few months ago–in the upper ’40s, I think, around Lexington. The cyclist was lying injured in the street and the cops didn’t even try to protect him. She had to stand there directing traffic around his injured body. They should also report this to the TLC, who could suspend or terminate the driver’s taxi license. Other than backing one car length into a parking spot, or into a loading dock, backing on city streets should be illegal, period, without someone behind you directing you. There’s just no way to see well enough when backing to avoid running over a small child. I can’t believe I wrote “bike crash.” I meant: My wife saw a driver hit a cyclist. Problem: The police lack the funding to train up and sustain more than 11 detectives for the “Accident” Investigation Squad. Solution: Mothball as many police cars as necessary to create savings (reduced operations and maintenance costs for vehicle fleet, more money for detective’s training and salary). These things take time to scale up. Mothball one police car for every un-investigated injury that meets the “grievous bodily harm” standard. Eventually equilibrium will be reached, and I don’t care if all NYPD’s cars have to be mothballed to make it happen (mothballing a helicopter would yield much higher savings). Maybe if the NYPD didn’t devote 14 cops to following around Critical Mass rides, a squadcar to giving tickets to recreational cyclists in Prospect Park, police escorts for Jay-Z they might have additional resources to allocate to helping people who have been maimed. If the witnesses are willing, they can make a complaint to the T&LC for a reckless driver where they were not the passenger. The complaint process involves the witnesses attending a hearing, but there is a commission that looks at this and applies the indicated reckless behavior to the T&LC rules, and the driver can be found guilty and fined, with points added to their license. Any police report of the incident would add to the documentation, but may not be necessary. I recently went through this process, and it made one taxi driver responsible for his egregious actions. It’s really cool to shoot a gun in NYC, as long as the bullet is 6 feet wide, weighs 3,000 pounds and has four tires.